Product #15858 | SKU DDJ-SP1 | 0.0 (no ratings yet) Thanks for your rating! 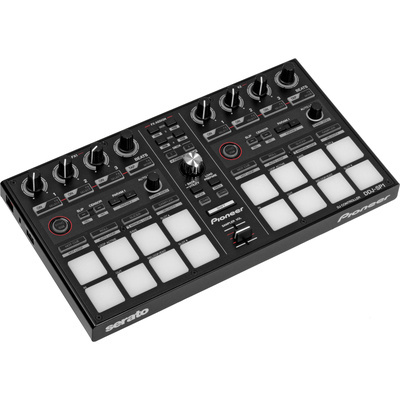 The Pioneer DDJ-SP1 Serato Sub-Controller is a USB bus-powered performance controller designed for DJs who use Serato DJ software and want additional performance pads, knobs and buttons for triggering samples and applying effects. The unit features 16 velocity sensitive trigger pads, eight per channel, with functions such as In, Out, Loop Active, Reloop/Exit, Save, Slot Up, and Slot Down. The output level of the pads can be controlled by a sampler fader and also by pushing the pads with different amounts of force. Looping can be performed in both automatic and manual modes. The unit features eight knobs for controlling iZotope effects and includes a slip mode function that allows the music to play in the background while looping and triggering samples. The controller comes with a free voucher for Serato Video software that allows you to incorporate videos, effects, and image files into your performance.